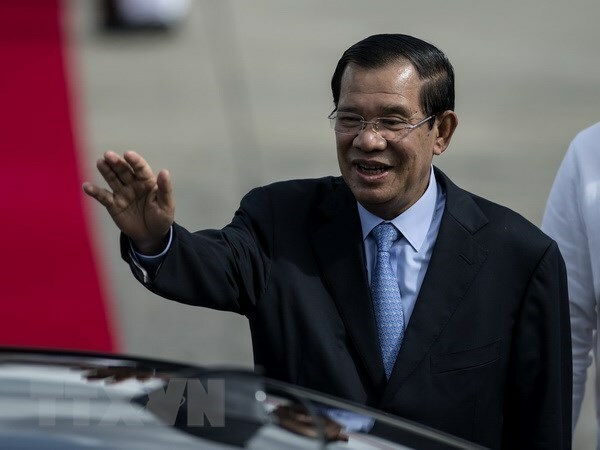 Phnom Penh (VNA) - Cambodian Prime Minister Hun Sen on March 29 announced a number of measures to boost economic independence and support local exporters, given the possible lifting of the European Union (EU)'s preferential trade arrangement under the Everything But Arms (EBA) scheme. Speaking at the 18th Government-Private Sector Forum in Phnom Penh, PM Hun Sen said the measures include cancelling certificates of origin fees, pulling out Cambodia Import Export Inspection and Fraud Repression (CamControl) unit from all border checkpoints, and removing the Kampuchea Shipping Agency and Brokers (Kamsab) officers from all ports. Also, the Cambodian Government will reduce logistics costs, fees on inspection of cargo containers by scanning machines, and fees for getting customs papers stamped, he said. From April 1, the fees for scanning cargo containers will be cut by half to 10 USD for a 20-foot container and 16 USD for a 40-foot container. Electricity tariff has been reduced by 2 US cents per kWh for the industrial sector from this year, he said, adding that from next year, the annual 28-day public holidays will be cut by seven days. The measures could lower operating costs for exporters by about 400 million USD per year, PM Hun Sen said and noted that if the EU requires the country to pay the tariffs, it will be able to meet the requirement. According to the PM, if the EBA is not withdrawn by August 2020, Cambodia will still automatically lose it when the nation graduates from the least developed country status. The EU is a major trading partner for Cambodia, particularly in the garment and footwear sectors. As a least developed country, Cambodia has enjoyed exports of all products, except arms and ammunition, to the EU market with zero-percent tariff since 2001.